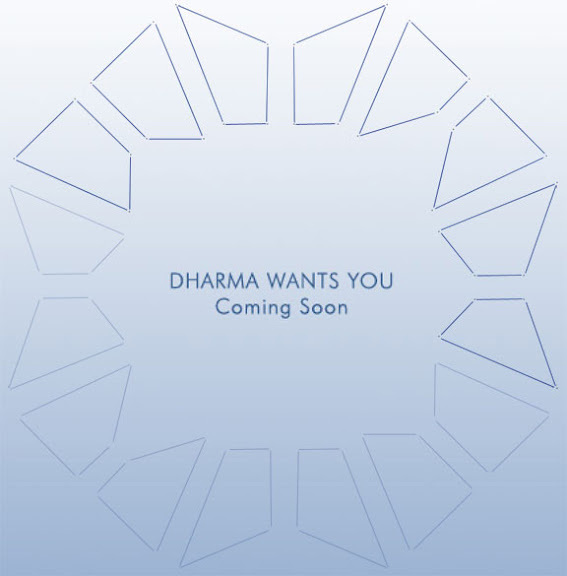 The Dharma Wants You website has been adding dots just above it's coming soon graphic, actually twice since launching on Friday. At first they appeared to be random, but now it looks like a pattern is emerging. I have "connected the dots" to make the pattern easier to see. Will this eventually draw out some sort of Dharma logo or other message, or is this simply a countdown clock to Comic-con? UPDATE 7/22: More Dharma Dots today. I've updated the graphic with the new dots and extrapolated the remaining dots. The little bit of OCD in me is really annoyed by the fact that the left and right sides don't match up yet. The pattern is definitely not symmetrical. At DarkUFO, they were trying to line up the dots with the Dharma logo, but IMO it doesn't line up very well (you have to turn the logo sideways, and even then it still doesn't quite line up properly). Dot watching - the new hiatus hobby. Maybe the dots'll end up being some sort of variation on the Octagon logo. I feel that we are missing something here. Maybe they'll be numbers or words? Maybe a web site we need to go to or a number to call? What if RuckusGuy is adding the dots and not Octagon or Dharma. I've been fooling with them on photoshop but haven't come up with anything yet. Also, always remember, don't agitate the dots. on the list of film editors for the season finale of season 4, theres a dude named "henk van eeghen", dont know if anyone has commented on this yet but yeah.. just thought it was worth mentioning! That updated dotty map looks interesting, although it still doesn't look neat enough to be a proper logo. It might be an exploded Dharma symbol ? In the updated visual that Dennis has done, I wonder if the shapes (if that's what it's meant to be) are part of these tests at Comic-Con? Maybe it's part of what you need to do to be recruited? Dennis is right, that figure lacks any type of symmetry, even turn and rotational. But each pair of shapes are symmetrical. I think I might play with that though for a while and see if the shapes are like a tangram (although there would be more than 7 pieces) and can make a puzzle. Good catch TSA. :-) I think that someone on DarkUFO or Lostpedia mentioned that Van Eeghan is indeed the name of someone on the regular LOST production crew, but I forget if they mentioned why it was used. Don't know if TPTB just liked this guy's name and used it, or what. Great work, Dennis! Ange, I like your idea that maybe this is some sort of aptitude test for the recruiting drive. Maybe you have to take all these pieces and put them together to make a square or something! LOL Or else it will be a really weird Dharma symbol..maybe one that reflects the New Dharma Initiative for the 21st century! Isn't each pair of shapes a mirror image? Could that be significat in any way? Maybe it's just going to be the stylized 'Lion King' Broadway logo, heheh. I hate to say this, but it does look like the Lion King logo! LOL Boy Disney doesn't miss a beat does it?! LOL, Capcom and Scoutpost! It will be interesting to see how many Disney tie-ins worm their way into this game! Unless two minds are uncannily thinking alike here. Nope, it's an exact match pixel for pixel... boo Savas! This screams Campoop and the 815 billboard again. I have more to say on the subject of credit where credit is due but I'll keep it to myself. I'm wondering if we connect the dots in a different way id something would "appear". I am looking at the page and gonna try a few things. Here is another way to connect the dots. Looks more like a clock. 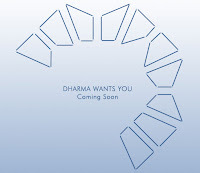 I think the Dharma logo route might be right, but why would they rotate it like that? Okay so I posted a comment before with the link to Jorge Garcia's blog (here). 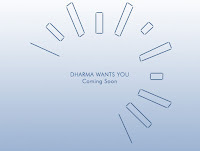 That Dharma logo, while probably nothing, has markings that are turned on the side. Like the image Dennis has in his post, it seems the three solid lines are rotated to be on top (turn Dennis's Dharma three more time clockwise). Otherwise the markings are the same as what Lostpedia has for Dharma symbols. Its not an official symbol, but I just really think its a strange coincidence that Jorge has a Dharma logo randomly appearing in London 2 days after the "dots" started to appear for us. And that the logo is not the right way up. There is a phone number for that dry cleaner on the sign in his blog which I can not make out, but I'll call it if someone else can. PS: Nice new blog look Dennis! Have to agree that it looks like the regular Dharma symbol. The new drawing shows the white (negative) spaces. I, too, am suspicious of Jorge's posting. That symbol looks slapped up (whether in person or Photoshopped)...covering "dots" on the sign. I wouldn't put it past Jorge to be involved in this...he's the sort that loves these kinds of thing. Noooooooooo, not that name again! :-o Heehee. Yeah, I feel sorry for the poor peeps who can't just say that they found this at such-and-such and need to take the credit. I'm glad that we have Dennis on the team, he will have gone through every permutation possible by Friday, heheh. Ya'll have got a point there about Jorge's bagua. The timing and the uneven placement (yuk) are suspicious. Hey, Dennis: DocArts just posted your latest Dot pic and gave LostArgs credit! You're world famous! Here's the link to DocArtz. BTW: Tapdawg is posting at DocArtz about a handout given by Dharma recruiters. Something about origami as an aptitude test. Maybe that's what the dots will mean? Origami eh? I wonder if you can arrange the shapes made from the dots in such a way that you can fold them into an octagon shape and thus pass a test. I have ZERO origami skills, but I'll give it a try with some printouts. Oh snap, I just looked at Tapdawg's pictures on DocArtz, and I *think that Octagon logo is a little different than the golden one. 2. It looks like it's made of separate pieces or shapes that resemble what Dennis put together. It's so blurry though, even zoomed. So, what do you reckon folks? one more picture from Tapdawg on DocArtz. Sheesh Dennis you are kind of a genius, you almost had it. Note the octagon on the door of the "booth". Is that what our dots are making? I think that logo is what's gonna pop-up on the 28th! Dennis, you're great. And Tapdawg (originally on TLC) is doing a fantastic reporting job! 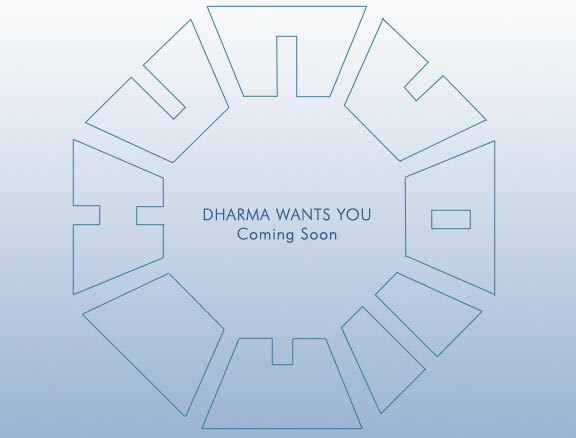 I've seen several different pics from Comic-Con of that Dharma logo. It seems to be a stylized version of the logo we know and love! Maybe the DI is trying to modernize their image. Why do they look like letters to me? Of course, HUNUOIIN doesn't really spell anything, does it? I'm sure that you would have hit the right pattern on the next permutation Dennis! Do these letters mean anything to anyone? Maybe an anagram?